Domus Trinitatis is the home of Sr. Anne Marie Walsh and Sr. Marie Hesed from the order of the Society of Our Lady of the Most Holy Trinity (SOLT). 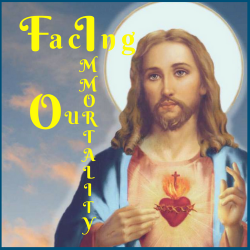 The beautiful Facing Our Immortality retreats are led by Sr. Anne Marie Walsh, a two time cancer survivor. Please read below to learn more about Domus Trinitatis and SOLT. Domus Trinitatis offers a beautiful setting for prayer and relaxation, where you can leave the busyness and noise of the world to spend quality time with Jesus. Walk a beautiful Rosary Walk, meditate on the Stations of the Cross, spend time in the Meditation Garden or in the small intimate chapel for Eucharist Adoration. Domus Trinitatis – A destination that will help to renew your relationship with God and His Mother. ​Spiritual Retreats of various types will be led by Sister Marie Hesed and Sister Anne Marie Walsh. Sister Anne Marie was assigned to the SOLT Mission Domus Trinitatis in 2015. She currently leads Healing of Family Retreats, Ignatian Retreats, Retreats on Dignity and the Vocation of Women and has begun to offer retreats for women with cancer. She speaks at different conferences and is a regular contributor to several Catholic publications. To learn more about Domus Trinitatis, link here.